After seeing a few photos and hearing that Sri Suva Subramaniya Temple, in Nadi, is the largest Hindu temple in the southern hemisphere I considered it a ‘must see’ on a recent trip to Fiji, both because I was interested in the structure as a Hindu place of worship and also because, according to what I knew at that time, it seemed a little out of place in Fiji. The island nation proved itself to be a fascinating melting pot of people, culture and religion however and a visit to the temple is a great way to learn about Fiji’s Hindu culture. Before visiting Fiji I expected the majority of Fijians to be south pacific islanders by origin. A little pre-trip research informed me an Indian population remained in Fiji, following the introduction of Indians to Fiji to work on the sugar can plantations. However, I was still surprised at the sheer number of Indian faces I met and saw in Nadi. I don’t know why I was so surprised really as the construction of large temples is often indicative of a large following in the local area. I must have not given it quite enough thought! Sri Suva Subramaniya is a peaceful haven away from the chaos of the shops and traffic in modern day Nadi. 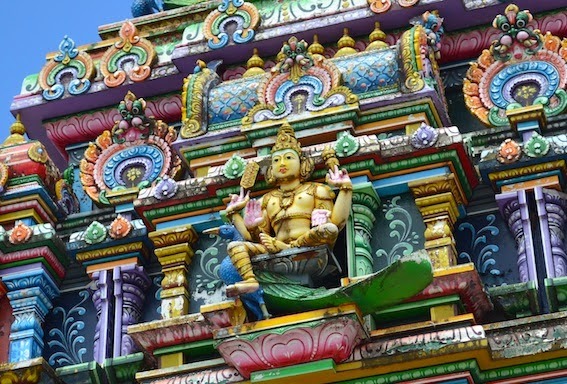 The temple brings bright colours and characterful depictions of deities to the southern end of town. It is one of the few places outside India where it is possible to see traditional Dravidian architecture. The artists that completed the paintings came from India, bringing with them the wooden carvings of deities that feature in the intricate designs of the temple. Sri Suva Subramaniya temple is dedicated to the deity Murugan and consists of three parts. The main part of the temple complex honours Murugan while the others are the Ganesh temple and Meenakshi and Shiva temple. While the temple is a place of worship, with each feature’s dimensions having specific religious meanings, it is also an extremely artful, colourful and inspiring building, especially if you look up towards the ceiling in the main complex. In exchange for a $5 Fijian entry fee, I was provided with an information brochure when I arrived at the temple, which explained what some of the paintings depicted. I was otherwise left to wander around myself. The only place that was strictly off-limits to non-devotees was the inner sanctum of the main temple and I was asked to be respectful when using my camera and limit photographs to being taken from the outer perimeter of the main complex. One of the many reasons I love travelling is that I love learning about different cultures and what other people believe. Being given permission to enter a place of worship is something I see as a privilege so I feel it is essential to show appropriate respect. Visitors are asked to dress modestly and remove shoes before entering the temple complex (on a hot day I’d suggest wearing socks as the ground can get hot). Women are requested to cover their legs and are given a sarong at the entrance if required.